Posted by sarcozona on January 27, 2010 . 7 comments. I’ve been keeping track of barometric pressure in order to get a better idea of how it influences my migraines. I believe that fast and/or large pressure changes are probably triggering many or most of my migraines. 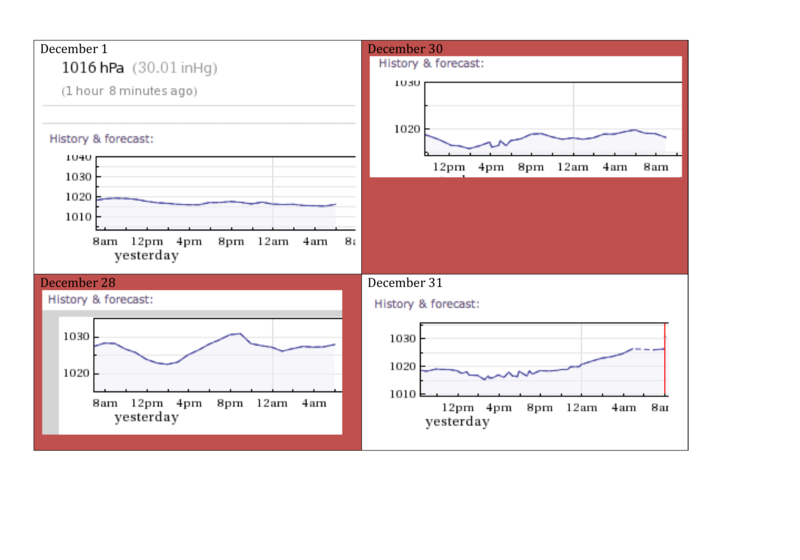 Below are graphs of barometric pressure throughout December when I did and did not have a migraine. I did not look at the barometric pressure every day, so not all days are represented. Days when I was well are particularly underrepresented. Time is on the x-axis and barometric pressure (hPa) is on the y-axis. On these days, I did not have a migraine at the time the data was plotted. However, on two of the days (highlighted in red) I got a migraine later in the day. On December 31st, I had a headache, but it was not a migraine. Click for larger view. I did not look at pressure on enough days when I did not have a migraine to really determine if small or gradual pressure changes and steady pressure do not trigger my migraines. I would have expected to have a migraine the night of December 31st if fast pressure changes gave me migraines. Perhaps they were too small or I slept through the migraine. 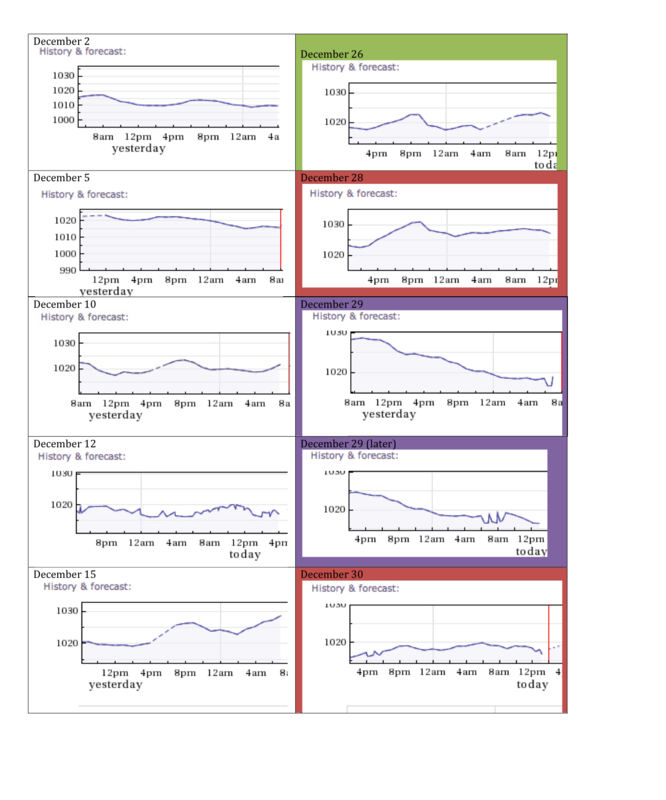 These are graphs of barometric pressure on days I did have migraines. The day highlighted in green is a day that triggers other than pressure were present. Red highlighting corresponds to days in the "no migraine" picture where I began the day without a migraine, but developed one later on. Purple indicates days that I began with a migraine and it became more severe. Click for larger view. Fast pressure changes are certainly associated with many of the days that I had a migraine, but not all. The pressure changes on December 2nd and 5th seem slow and gradual. December 10th’s pressure changes also did not seem that extreme. Yet I still had migraines. December 2-10 I was frantically working on papers and studying for finals, so perhaps I was more stressed than I thought and that triggered those migraines. It’s possible that pressure change only causes migraines for me or is more likely to cause migraine for me in conjunction with another trigger, or that they aren’t related at all. I’ve been trying to do a better job of keeping track of pressure and my migraines this month, so hopefully January’s data will be more helpful. More data on my migraines in the archives. This is really interesting stuff to track — I actually had to do it for a few months over the summer, when I was having frequent migraines after a car accident. I never really pinned down exactly what my weather triggers were in terms of the trackable data, just that something about an oncoming thunderstorm was guaranteed to make me curl up at my desk and want to die. Have you tried messing with altitude changes at all? For me that started as a trigger, but was one of the first to go away as my head injury started to heal (…which it’s still doing. *sigh*). If you’re willing to experiment on yourself, and have handy mountains around — I don’t recall the topography near Flagstaff — it could be one way to narrow down what kind of pressure triggers you have. Also, yikes! Five migraines a month is still a lot, though I know it’s got to be better than when you were back east. Enjoy your picnic-table-burying snow! We haven’t had any significant accumulations here since the fall — I guess it all went your way instead. Ah, now I read the archives and feel silly. :-p I should’ve figured you would have a much better-documented list of things that trigger you than I could come up with since May for my own. I definitely do get migraines with altitude changes. The drop from Flag to Phoenix kills me and I get sick as soon as they pressurize the cabin on planes. I’ve thought of a few ways I could experiment, but it’s so unpleasant that I’ve never gone through with any of those plans. Experimental studies involve extra migraines! If one window of a car is open and the car is traveling above 40MPH for more than 10 or 20 minutes, I will almost 100% of the time get a migraine from the pressure fluctuations inside the car. But I don’t think weather-related pressure ever triggers mine. Luckily these days, I have only about one every three months! Yay! what equipment did you use to track the barometric pressure? I relied on WolframAlpha, a website. Just search the name of the town you live in and barometric pressure.